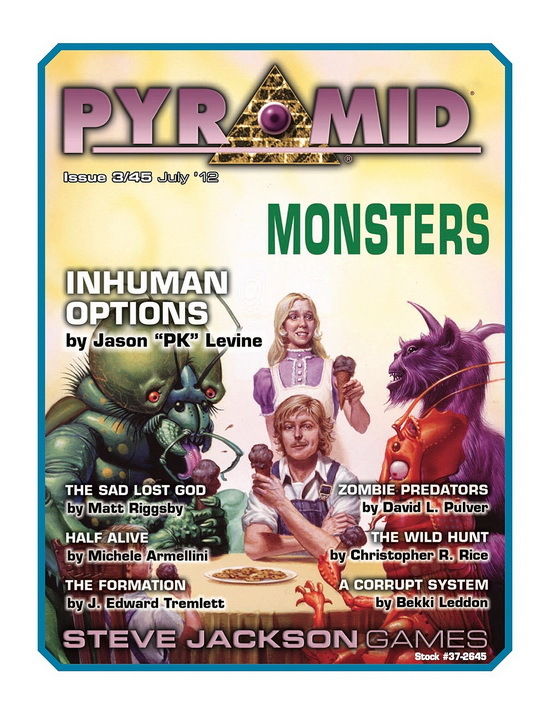 The latest volume of Pyramid alternated its monthly issues between three broad themes: Fantasy/Historical, Modern, and SF/Futuristic. 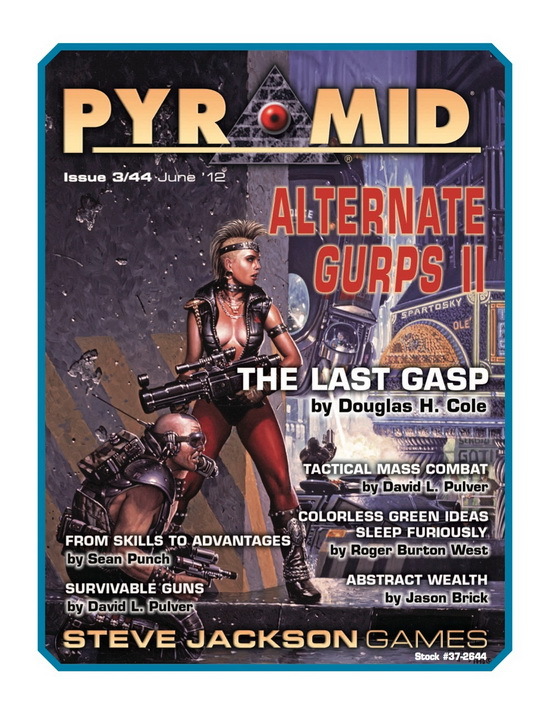 Each individual issue was also dedicated to a specific topic, ranging from established GURPS settings (such as Infinite Worlds and Transhuman Space) to specific genres (including cliffhangers and martial arts) to special-interest topics (such as space colonies or tools for wizards). When it comes to getting things done with technology and artisanal efforts, the past isn't what it used to be; it's better than ever! This month's issue is devoted to more gear and know-how of a bygone era. Our tinkerers' trove includes "Lord of the Manor," an exploration of how many households and what crops you need to sustain your Wealth. Composed by Matt Riggsby (co-author of GURPS Low-Tech Companion 3: Daily Life and Economics), it uses the GURPS Low-Tech foundation to keep your lands well-tended. There's one fact that science-fiction fans may have noticed: The future keeps getting more awesome! 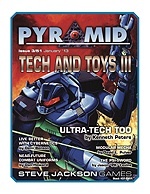 This month's issue is devoted to futuristic technology and gear. 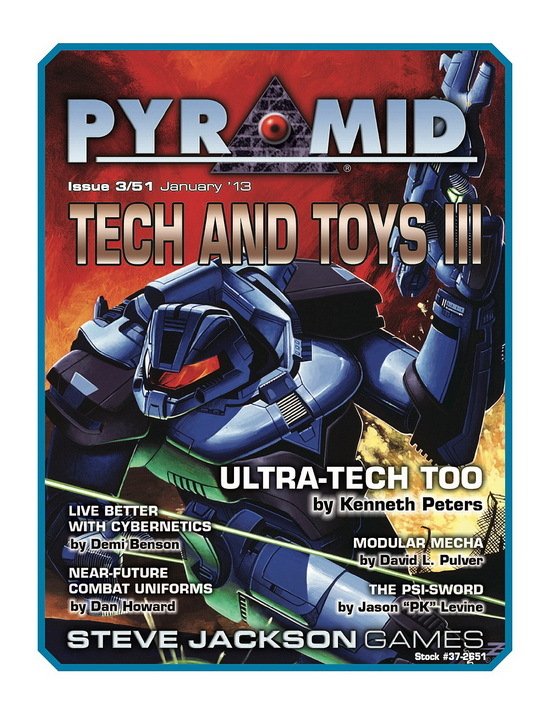 Our cutting-edge cache includes "Ultra-Tech Too," a collection of items from Kenneth Peters – the co-author of GURPS Ultra-Tech – that couldn't fit in that original volume. It includes new weapons, defenses, and other underlying tech you can add to a myriad of futuristic settings. Are you looking for new goodies to add to your dungeon-crawling campaign, but don't want to decipher crypt-ic sources? 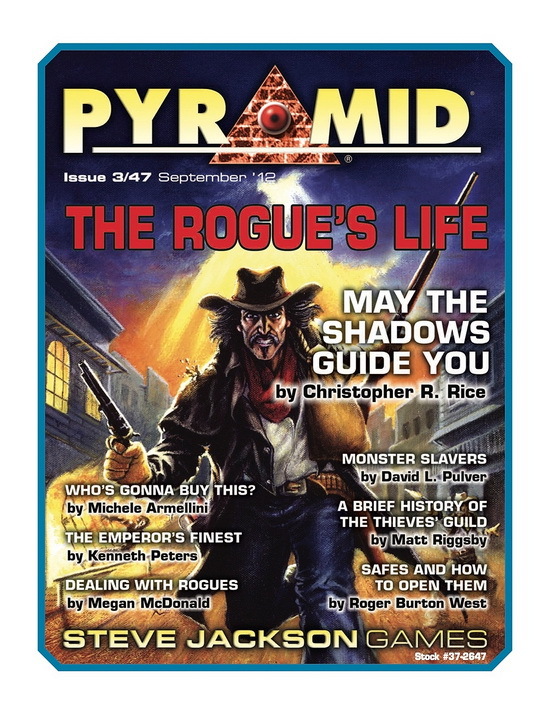 Pyramid is the trove you love, with another issue devoted to GURPS Dungeon Fantasy! 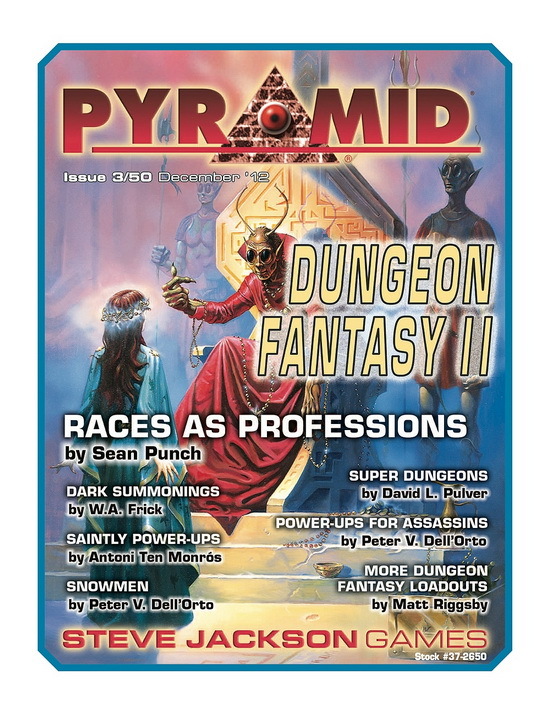 This issue's treasure includes "Races as Professions," an old-school approach of the good old days, when being an elf or a dwarf was both a background and a vocation! 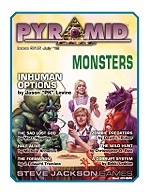 In addition to two GURPS templates, this feature by Dungeon Fantasy mastermind Sean Punch also gives information on power-ups and what their niches are in a campaign. Humanity has long looked up from Earth at the vastness of creation and exclaimed, "Get me off this mudball!" 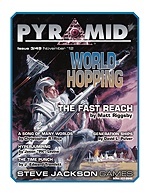 Pyramid is here to help, with an issue devoted to world-hopping: places to go, and how to get there. Your space-age strongbox includes "The Fast Reach," an oft-dangerous cluster of star systems that allows speedy travel between two distant regions, as detailed by Matt Riggsby (author of the otherworldly travelogue that is GURPS Locations: Hellsgate). It includes a system map and tips for how to incorporate it into many types of spacefaring settings. Magic lurks in shadows, and many who practice the impossible do so discreetly. 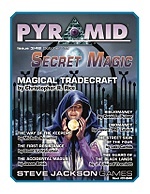 This month's issue is devoted to secret magic and those who maintain the supernatural subterfuge. 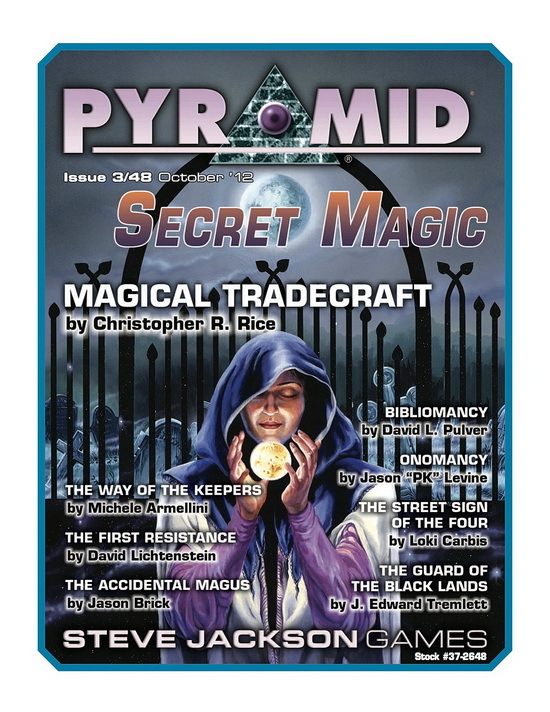 Our ghostly grimoire includes "Magical Tradecraft," an expansion of the Ritual Path magic system found in GURPS Monster Hunters 1: Champions. Use these new rituals and elixirs to aid sneaky snoops and obscured assassins. Fire up your Jacob's ladder, tune your theremin, and tell the world that it is they who are mad! This month's manuscript is devoted to weird science! 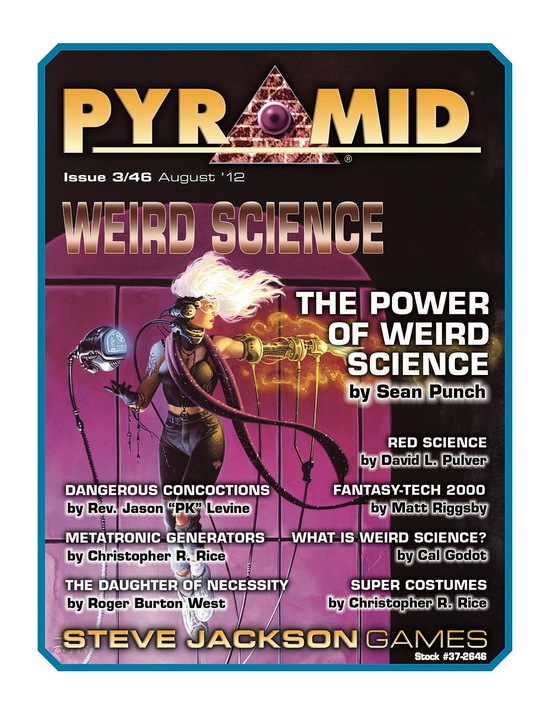 Our senses-shattering symposium includes "The Power of Weird Science," which describes how GURPS Powers can form the basis for your weird gizmos. Written by GURPS Line Editor (and Powers co-author) Sean Punch! Are you looking for more magic at the gaming table? This month's manuscript is there for all your eye-of-newt needs. This month we visit the topic of Thaumatology for the third time, with more magical alternates and tweaks to add that spark back into your life. 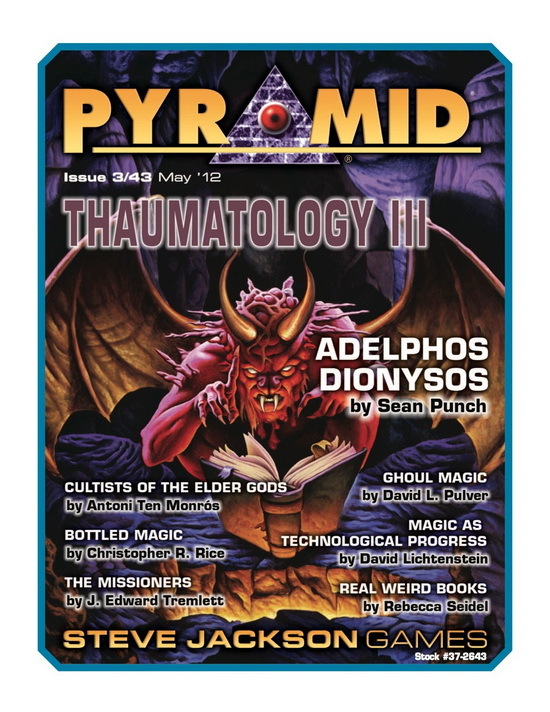 This issue's mana-marinated morsels include "Adelphos Dionysos," a school of magic that follows the form of GURPS Thaumatology: Magical Styles. Written by GURPS giant Sean Punch, this style draws on the power of wine to give its practitioners power sublime! 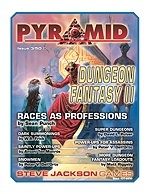 What kind of articles did the third volume of Pyramid carry? 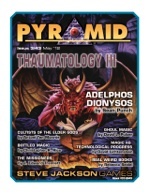 If you want to sample something fantasy-themed, try "The Book of Null" from Pyramid #3/13: Thaumatology. If you like modern-day adventure, peruse "The Bricks of Marû Dù" from Pyramid #3/05: Horror & Spies. If you're in the mood for a futuristic article, download "Looting Your Life Pod's Locker" from Pyramid #3/18: Space Exploration.